Jon Jones is putting in the work in preparation for his Octagon return, and that comeback now appears to have a tentative date. 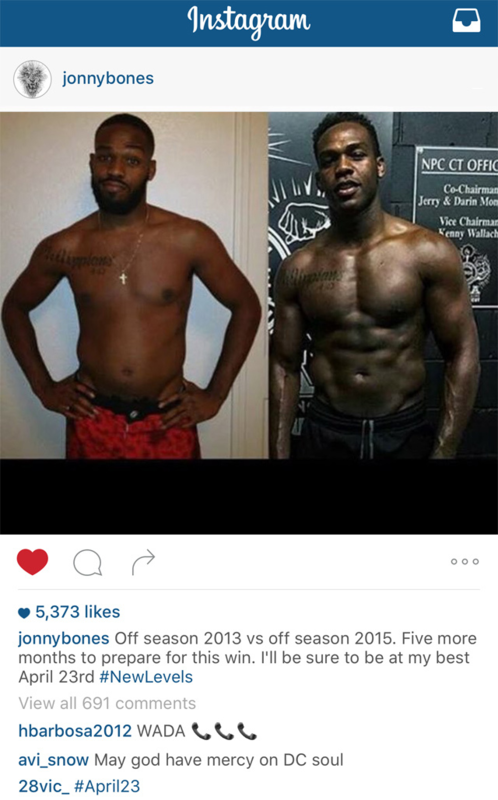 The former UFC light heavyweight champion took to Instagram to post a before-and-after picture indicating what he used to look like during his “offseason” as compared to now. He also captioned the photo with a hint as to when he might fight again. In keeping with his usual routine, Jones then deleted the post. April 23 is the date the UFC has announced a pay-per-view event at New York’s Madison Square Garden. Of course, MMA must be legalized in the state before the promotion can hold a card there, a battle that has been ongoing for years. Jones, a New York native who trains in Albuquerque, N.M., would make an ideal headliner for such an event, which would likely be UFC 198. He would almost certainly face Daniel Cormier in a light heavyweight title bout. Jones was recently reinstated by the UFC after being suspended and stripped of his title for his involvement in an alleged hit-and-run incident earlier this year. In his absence, Cormier defeated Anthony Johnson to capture the vacant 205-pound title. Jones defeated Cormier via unanimous decision at UFC 182.